Cream together butter and cream cheese in a stand mixer on low to medium speed until blended. Add flour a 1/2 cup at a time, mixing well after each addition, until blended. Dough will be sticky and hard to work with. Divide dough into several fist-sized balls, put in a bowl covered in plastic wrap and refrigerate until firm and cold. Dust a clean surface and rolling pin generously with flour, and roll one dough ball out to 1/4" thick. Dust edge of cookie cutter in flour (heart shaped cutters, or traditional 1.5" round), cut out cookies and release onto ungreased cookie sheet. Try to work quickly so the dough doesn't get sticky and soft. Repeat for next dough ball, only taking them out of the fridge as needed. Using the back of a spoon or your thumb, gently press the center of each cookie to form a shallow depression. 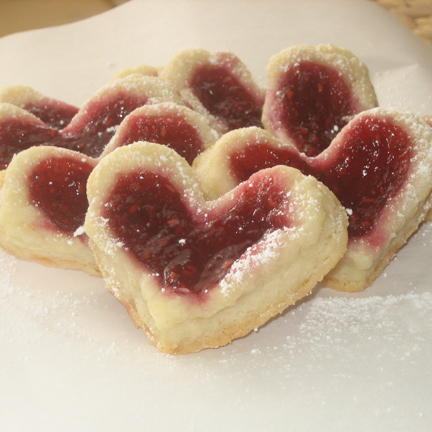 Spoon in about 1/4 - 1/2 tsp of jam onto each cookie, depending on size. Bake for about 14 minutes, or until bottom edges just barely start to turn brown. Cool on cooling racks several hours or at least until room temperature. These cookies are best made in advance. Dust lightly with powdered sugar just before serving. Enjoy!